Info "I'll hold the log for you, so you just saw. All you have to do is move it forward and back steadily." Logged In is one of Young Cricket’s Microgames in WarioWare: Smooth Moves. The player must steadily saw through a log. If it is done poorly or too quickly, the saw will bend like rubber. The wood may be shaped like a heart when cut. Rarely, the wood may be a piece a bamboo. 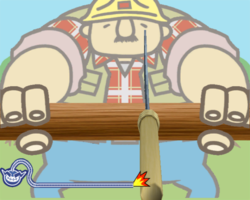 1st level difficulty: Thin piece of wood. 2nd level difficulty: Medium piece of wood. 3rd level difficulty: Thick piece of wood. This page was last edited on June 20, 2018, at 17:18.